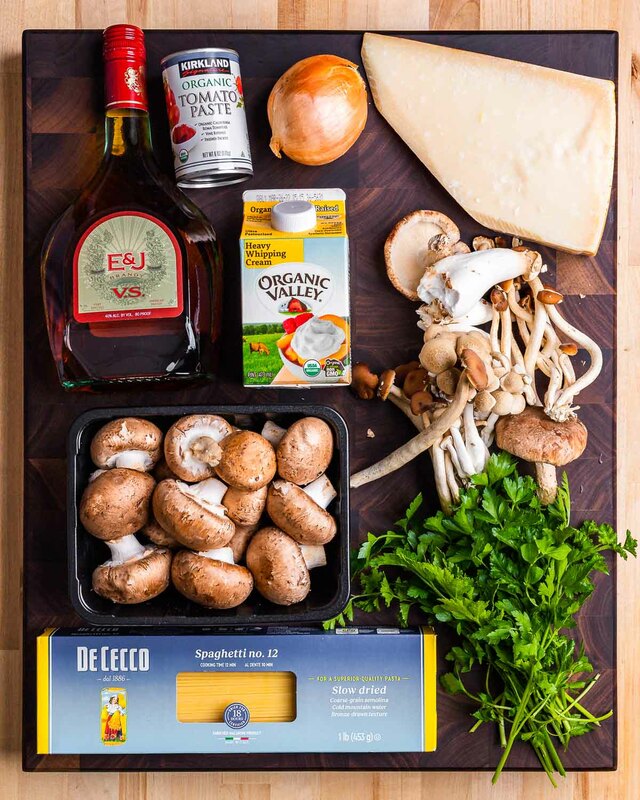 Mushroom Brandy Cream Sauce sounds delicious – right? I mean, if you didn’t like mushrooms you wouldn’t be reading this recipe. 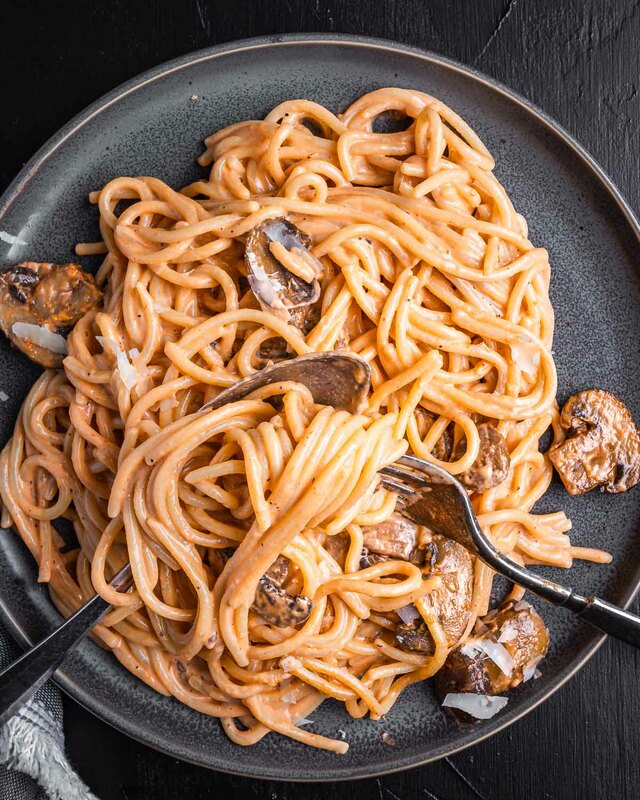 Everyone loves spaghetti, and who can say no to a cream sauce with brandy. You get the idea – let’s go make it! Why Make A Mushroom Brandy Cream Sauce? Well for starters it’s damn delicious. But it’s also a really easy dish for a novice that simultaneously yields professional results. There’s just something special about a perfectly cooked cream sauce and pasta dish. Maybe it’s the comfort food aspect of it or the flavor the brandy imparts in the sauce – I don’t know. What I do know is that time and time again cream sauce pastas are some of my family’s favorite dishes. Just think about some cream sauce pastas: Rigatoni Ala Vodka – always a solid crowd pleaser; Fettuccine Alfredo – I could eat a pound of this myself. Check out my recipe for another top notch creamy pasta, Cajun chicken pasta. Now that’s an awesome dinner idea. The heavy cream and brandy. Adding the tomato paste after the mushrooms have sauteed. As its name implies, there are a lot of mushrooms in this dish. This time around, I used a mix of baby portabellas and white button mushrooms. Honestly any type of mushroom would be fine. The more the better IMO – but I used exactly 1 pound. The recipe calls for 3 oz of tomato paste, which is half a can of the Costco Tomato paste. The tomato paste box of 12 is one of the best values at Costco. I always have paste on hand in my pantry. Eight ounces of brandy – I used VSOP. One pint of heavy cream – make sure it’s heavy cream so the sauce does not break. If you use half and half or light cream you risk losing the sauce. 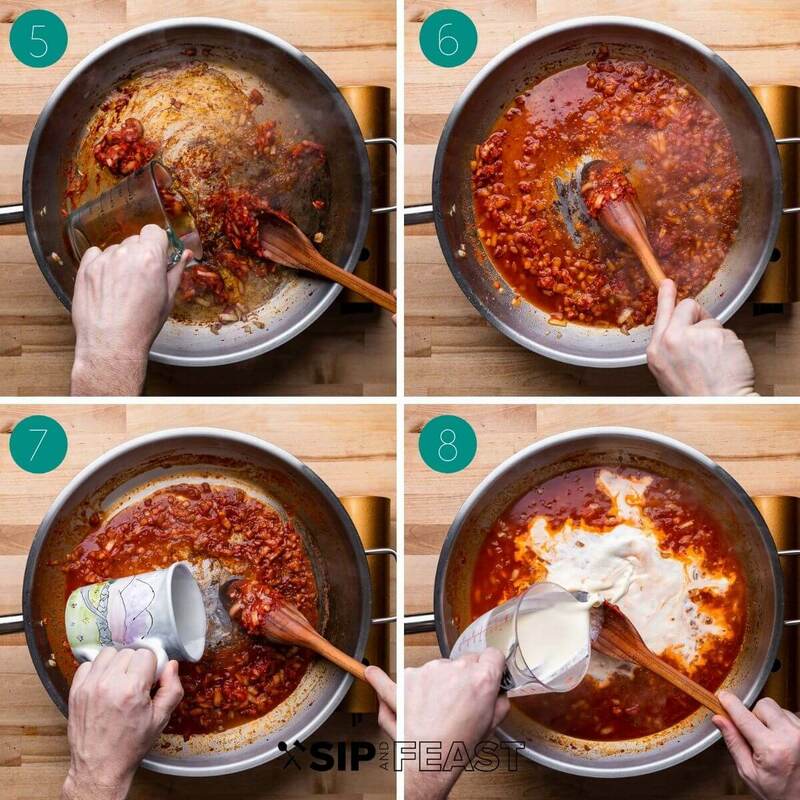 The pasta will no longer have the silky creaminess seen in the pictures. Easily avoidable if you stick with heavy cream. 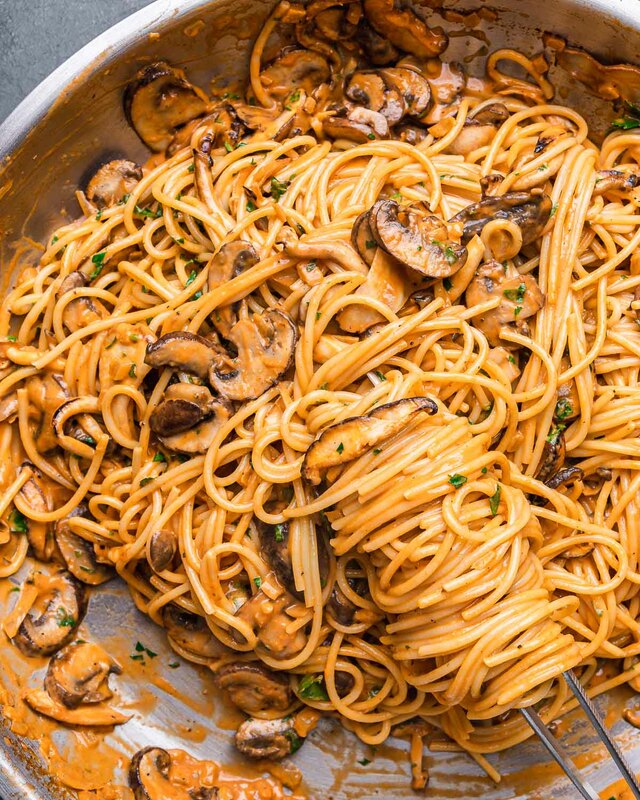 One pound of spaghetti and some salt, pepper, and pasta water complete the ingredient list for this Mushroom Brandy Cream Sauce. Pasta water is reserved in a coffee mug right before the pasta is drained. This water can easily smooth out a dry pasta if it sits too long before serving. I suggest serving and eating this dish minutes after cooking to get the best results. I did not need to use pasta water to thin the sauce but it is always a good insurance policy. Bring brandy to a boil then lower heat and add cream. After the paste, cream, and brandy are incorporated add the pasta and get ready for plating! Prepare the pasta and right before draining, save a mug of pasta water. While the pasta is boiling make the sauce. 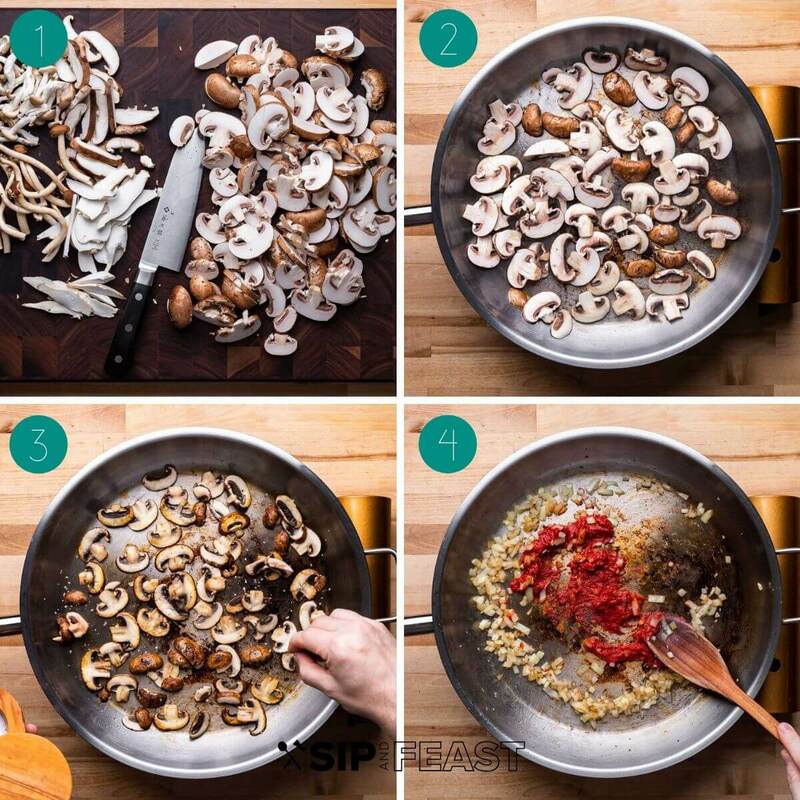 Start with sauteing the mushrooms: heat a large pan over medium heat and add about 2 Tablespoons of olive oil, then add the mushrooms and saute until they release their water. About 5 minutes. 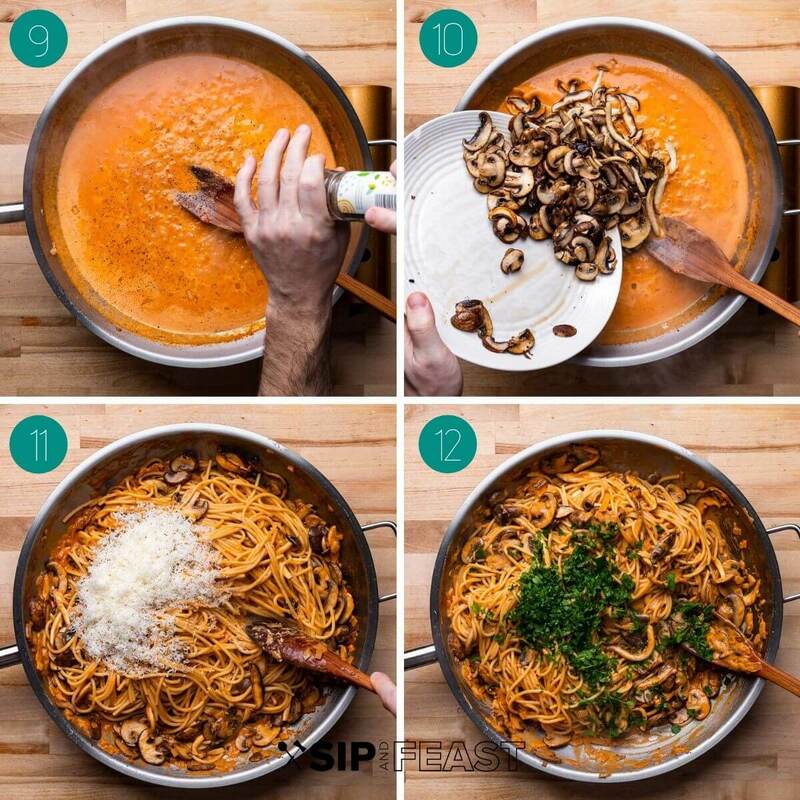 After they release their water, add the tomato paste and saute with the mushrooms for 2 minutes. Next, add the brandy and turn the heat up to high. Boil it out for 2 minutes to evaporate the alcohol. The good flavor will be retained but the strong alcohol smell will be gone. Turn heat to low and add the cream. Also add the salt and pepper. Stir the mixture together and make sure it is all incorporated into one homogeneous cream mixture. Cook it on low for about 3 minutes. The sauce will turn a pinkish hue and the flavors will meld, creating an out of this world flavor. Before adding the pasta, taste the sauce and add salt and pepper if needed. When satisfied with the seasoning, add the pasta, stir it all together and remove the pan from the heat. Keep mixing it up as you get ready for plating. If the sauce is too dry – add pasta water a couple ounces at a time. That will 100% do the trick to get the perfect consistency. All done! Just a perfect dish. Again if you love cream sauce pastas as much as we do, check out our Creamy Cajun Chicken Pasta , Italian Sausage Pasta or our Creamy Garlic Mushroom Pasta. Another real good pasta recipe without cream is our Spaghetti Amatriciana. Cook spaghetti according to package directions. Right before spaghetti is done, reserve 1 cup of pasta water. Slice mushrooms and saute in large pan on medium heat with 2 Tbsp of olive oil. Wait for mushrooms to release their liquid (about 5 minutes) , then add the tomato paste. Cook mushrooms and paste for 2 minutes. Next add brandy to pan and turn heat on high. Be careful because brandy can sometimes flame up. Cook brandy on high for 2-3 minutes until it boils. Turn heat to low. Add the cream, salt and pepper. Stir to combine and let cook for 3 minutes until sauce darkens up a little. Taste the sauce and check if it's properly seasoned. Add a little bit more salt or pepper if needed. Finally add the pasta to the sauce and stir everything together and get ready for plating. Enjoy! If the pasta gets a little dry add a few ounces of the reserved pasta water to thin it out. This shouldn't be necessary, but is nice to have just in case. Like I said in the final step it's really nice to have some reserved pasta water if the dish gets too dry. Sometimes the pasta absorbs too much of the sauce and you can be left with a dry dish. Instead of making way too much sauce, a better option is to always save the pasta water to help thin it out. 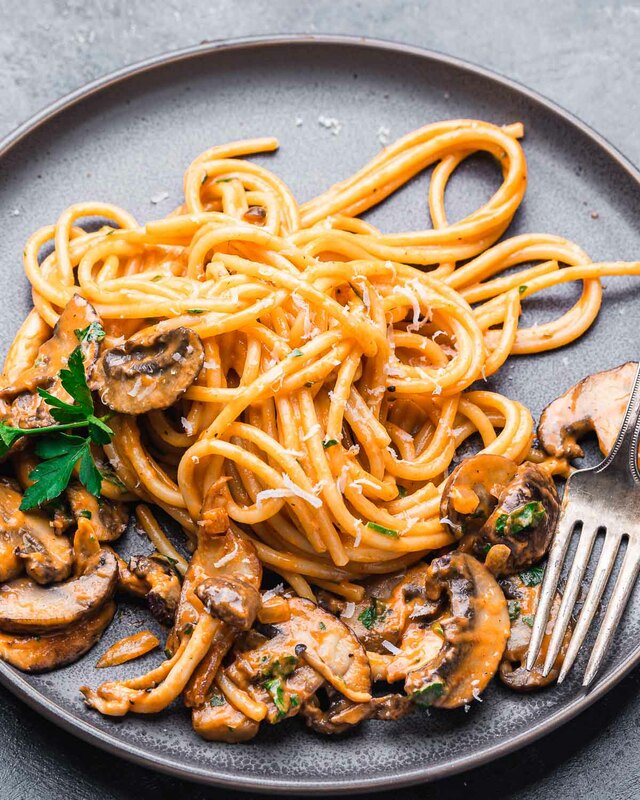 If you liked this mushroom brandy cream sauce pasta recipe we would really appreciate it if you would share it on Instagram or Facebook using #sipandfeast. Oh my! This is the best mushroom sauce ever!! Pinned it right away!!! Thanks for the share. Hope you enjoy it!